Mail is a pretty sweet, if somewhat basic, program. But considering that before Mail I was a die-hard PINE user for over a decade, the switch from typing commands in Terminal to using a drag-and-drop GUI was a big leap forward for me. So if some of my ideas seem pretty basic, that’s because, well, that’s how I like to work. Simple often means robust, and robustness is the key measure for me in any information management system. 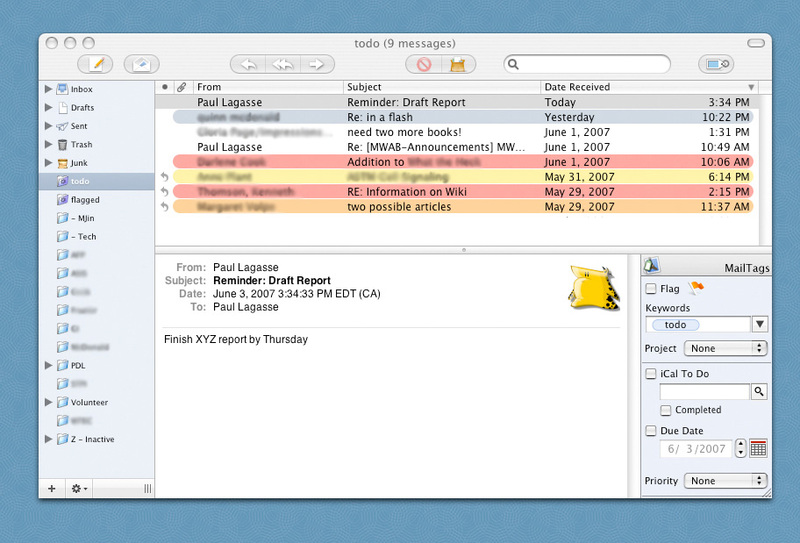 Mail is a rugged app, and you can tweak it out with any number of useful third-party plugins. I highly recommend checking out Hawk Wings. That’s where I found out about the plugins that I use: Indev Software’s MailTags and Ecamm Network’s DockStar. 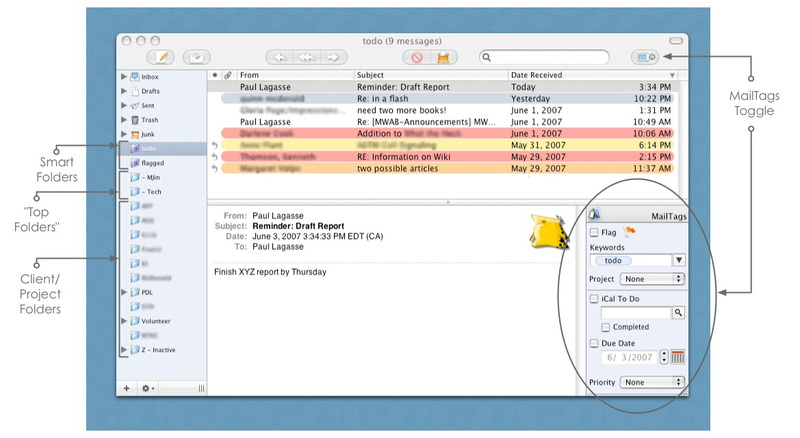 Prior to configuring Mail, you’re going to need to set up Address Book. Create folders for each client, and drop all your addresses into the appropriate folder. It’s a pain, I know, but trust me — it’s worth it. 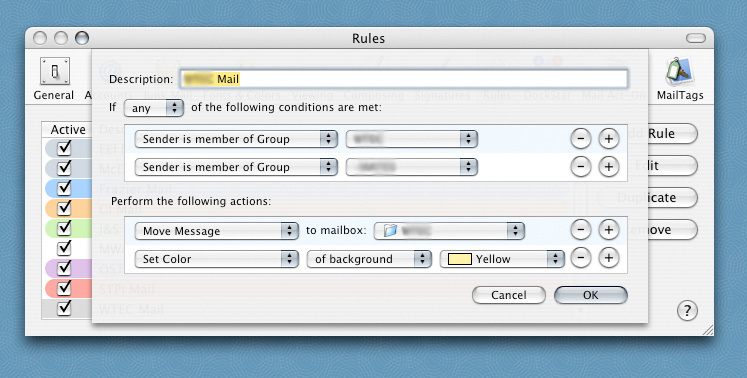 Why color-code the messages if they’re going to be routed to the client folder anyway? Glad you asked. Because I use Smart Folders and MailTags to create and manage to-do lists. The inbox is reserved for non-work related messages from friends and family. I also have two “top folders,”-MJin and -Tech. The former is where I drop my personal e-mails (the name is a holdover from my PINE days, when I used to save sent and received messages from individual people in separate folders. Messages from my wife went into MJin and e-mails I sent her went into MJout. Though it’s archaic, I’ve decided to keep MJin as the name of my personal “saved messages” folder.) The latter is where I keep e-mails from software vendors with registration codes, subscription confirmations, list instructions, and so on. Both top folders are periodically cleaned out and archived for permanent retention. I purge my client folders regularly according to my PaperJamming schedules. So that’s a quick overview of how I’ve configured Mail for my freelancing business. If you found this article useful, you might also be interested in reading about how I use PaperJamming and Rollabind to administer my paper files, and how I use Cocoatech’s brilliant Path Finder app to manage my electronic files. Likewise, if you have any suggestions for improvements, questions about my setup, or daydreams about the perfect file management app, please drop me a line. The email folder name that has stayed with me for a long time is my work folder titled _Almost Trash. Like most people my goal with email is to get them out of the Inbox and into a final destination. But at work, there are so, so many emails that I don’t want to delete but I don’t want to file, hence my folder called _Almost Trash. Like Paul uses the “Z” to get folders to show at the bottom of the list, I use the underscore so it shows up at the top of the list. When people see _Almost Trash they always get a kick out of it and usually say something like, I gotta try that.